When I flew to Europe last year I noticed my black compression socks were stretched and no longer in their original shape. They didn’t have all of the elasticity left in them. I knew I needed to get myself a new pair for flying to Australia and New Zealand. Obviously I needed a pair in their original shape, I was going to be flying two long-haul flights. Deep vein thrombosis is something I very much want to avoid. I did some internet research to find a really good compression sock and of course I checked out the different patterns offered. In my search I found the compression socks chosen most often, with the best patterns, were in the USA. 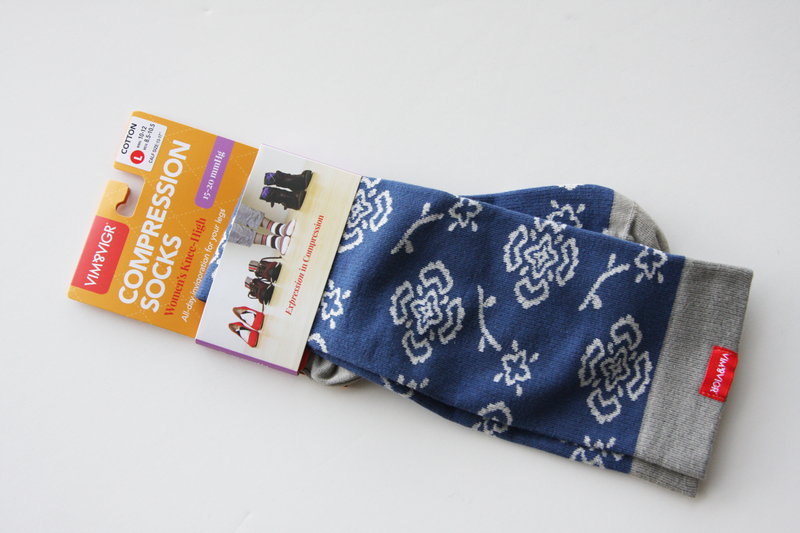 Canada has compression socks with patterns, but nothing that is different. Ooooohhhh I totally loved the patterns VIM & VIGR offered for their compression socks. The first thing that drew me to VIM & VIGR was the fact that they offer their compression socks in cotton and wool, on top of the normal nylon you always see. Then there was the pattern selection. They didn’t just have the stripes, polka dots and argyle patterns I had seen from other companies. The pair I really loved, I had not seen anywhere else. Of course I had to buy them. 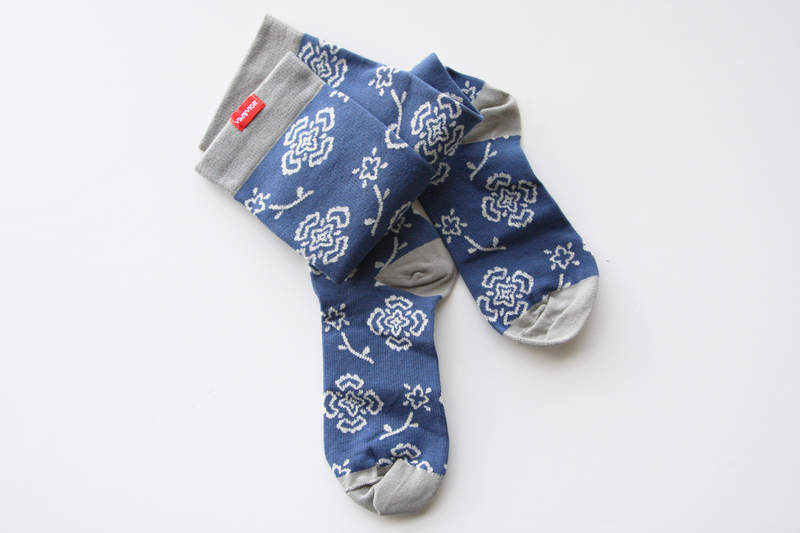 They are a blue and charcoal, cotton sock with the most awesome stick figure type rose pattern. Women’s Queen’s Floral is also a pretty awesome sock name. Although if a floral pattern is not your thing, they do have a cotton sock with a camouflage pattern. Plus, they have different seasonal collections. When I first visited the web-site there was an option to sign-up for their emails. By doing that, I received a $5.00 off coupon code. I loved and appreciated this option, especially because I was trying something new. I ordered my socks on Sunday night and because of the $25.00 shipping charge to Canada, I decided to ship to a USA address for $4.99 instead. While I am happy I had that option available to me, I hope the high shipping cost to Canada is something VIM & VIGR can work on, it would be great if these socks were more readily available here. My order shipped out on Monday and even though I chose the 7-10 day shipping option, by Thursday, the socks arrived at the address. That very fast delivery time totally impressed me. 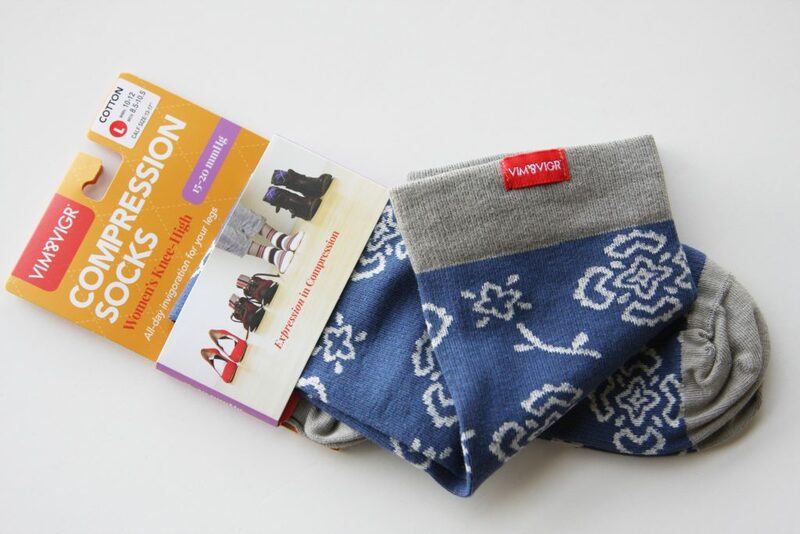 The fifth thing I noticed about the VIM & VIGR compression socks, after the fabric, the unique pattern, the coupon code and the unexpected fast delivery time (which obviously won’t always happen), was that these socks are just as beautiful in real life as they are on the web-site. The photos were wonderfully accurate. If ordering directly from the USA isn’t an option for you though, the VIM & VIGR website also lists three international companies, one in Canada and two in Asia. The company in Canada is 26.10 Design & Distribution Inc. (website here). They are based in Quebec and shipping is a fixed fee of $15.00 CAD to Canada. Unfortunatly they only have the regular polka dots, stripes and argyle choices everyone else has. They do however offer all three fabric choices, cotton, wool and nylon. Bliss & Bless (website here) is the company in Hong Kong and the company in Japan, Koshiya Medicalcare (website here), didn’t end up having any of the VIM & VIGR products on their site, that I could find. When I purchase shoes, I wear a woman’s 9-10 and my calf’s are larger, like about 17”. So, I ordered the Large size based on the sizing chart. The awesome thing is though, VIM & VIGR has socks with a Wide Calf option. Great for people who don’t fit into the other sizes but still want or need a compression sock for flying or exercising. There were two downsides to this sock that I noticed. The first one I experienced was because I am short and the socks are quite long. This means the socks come right up to the knee joint (or higher). When I had long travel days, I found they would cut into my leg. After two long-haul flights, a short layover, car travel times, etc, the socks were cutting into my leg pretty good. My first experience wearing these socks was actually a little painful. This might be because they are cotton and don’t have as much flexibility as nylon. I would also like to try a wide-calf option though, maybe that had something to do with it. The second downside, these socks took quite a bit of effort to put on. Again, probably because they are cotton and don’t have the flexibility nylon based compression socks have. You get instructions from VIM & VIGR on how to properly put the socks on, which is very helpful and appreciated, but they definitely take a lot more effort than I am used to applying when putting on compression socks. These compression socks are quite thick and tight, which is probably because of the cotton. I thought I could really feel them do their work. As soon as I put them on, my legs started to tingle. I wore these for my flights and I felt they did a great job. Although, because I am not a medical professional, other than lacking any obvious signs of deep vein thrombosis, I’m not sure how to tell. I have worn other compression socks before though and while I have felt my legs tingle, the other socks have never fit as snug, not like these VIM & VIGR cotton compression socks. Compression socks alone won’t prevent deep vein thrombosis, but they do help. I also try to get up and walk around regularly on flights. I loved wearing my VIM & VIGR compression socks with this great, modern pattern, I didn’t have to feel as though I was wearing my Grandfather’s medical socks. That right there is enough to make me purchase these again. Plus, even though I have not worn these socks for anything other than flying yet, they are so stylish I am willing to try them for exercise, sitting, and standing. 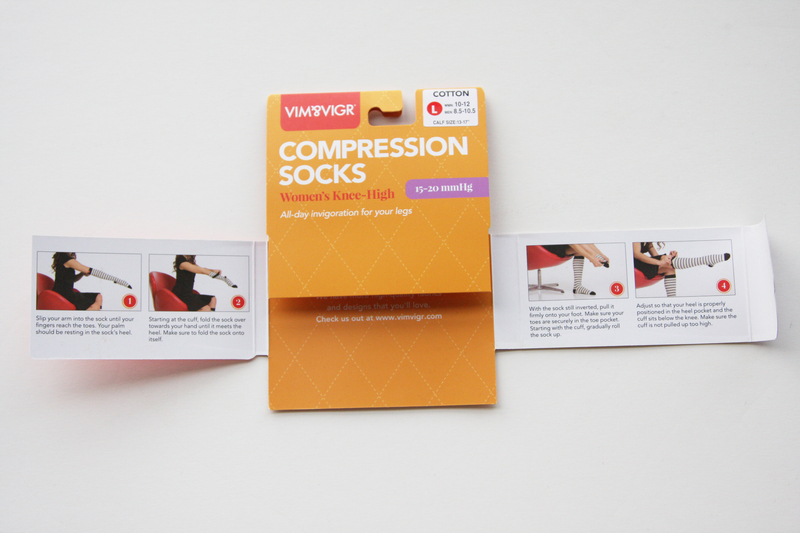 I loved my VIM & VIGR cotton compression socks so much I decided to become an affiliate marketer with them. If you are interested, you can click above on the purple VIM & VIGR, or you can click on the description on the Recommendations page. It will not cost you any additional costs to make a purchase with this link but we will receive a commission for referring you. I hope you will enjoy your socks as much as I enjoy mine.